Jim Rickards thinks that when you’re buying gold, looking for the best “entry point” is one key. And that makes sense. Ideally you want to enter at a price that is low enough, so you can store as much value in your portfolio as possible. You may look at that chart and think “Gold may never break out.” And that might be true – if you only see gold as a “commodity” valued for its growth potential. But Jim also sees gold as a “highly liquid and heavily traded form of money. That means the price can be temporarily manipulated from its fundamental value. And that is the factor masking gold’s real price… temporary manipulation. “Manipulation can be caused by central banks seeking attractive entry points or trying to squelch disorderly price spikes,” he says. And hedge funds “shorting” gold can instigate selling that might lead to a full-scale collapse of gold’s price. 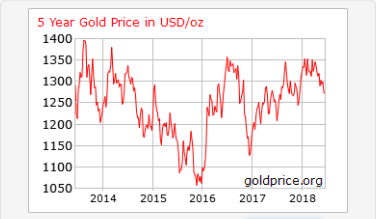 While its price can be manipulated, fundamentals like “supply and demand, monetary economics and the presence or absence of inflationary expectations” ultimately determine gold’s price. In other words, gold’s price can’t escape its fundamental value long-term, no matter how much price manipulation is attempted by hedge funds and central banks. And with the exception of a mild selloff in the 70’s, the U.S. has held onto most of its 8,000 tons of gold, despite removing the gold standard in 1971. So if the U.S. is holding onto its reserves in spite of the “price,” there must be something else going on. Now take a look at a different chart from the same Agora report. Notice how the TIPS and dollar price of gold correlate closely until 2017 (see red arrow). At that point the two diverge. Generally, when inflation rises, so do gold prices. When inflation dips, gold prices generally follow. But in 2017, they diverge. This may be resulting from gold price manipulation on the part of the U.S. to prop up the dollar (even though POTUS claims to be trying to weaken the dollar). 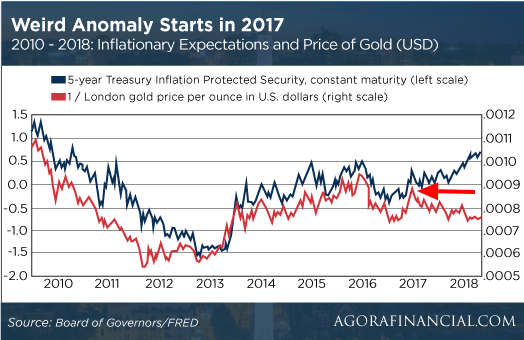 History indicates gold prices and inflation won’t remain divergent, however, and market fundamentals play a big part of the reason why. On the other hand, if strong growth — and inflation — doesn’t materialize because of Fed “over tightening,” the Fed will have to pause interest-rate hikes to avoid a recession. If that happens, Jim believes the Fed will push pause in September. 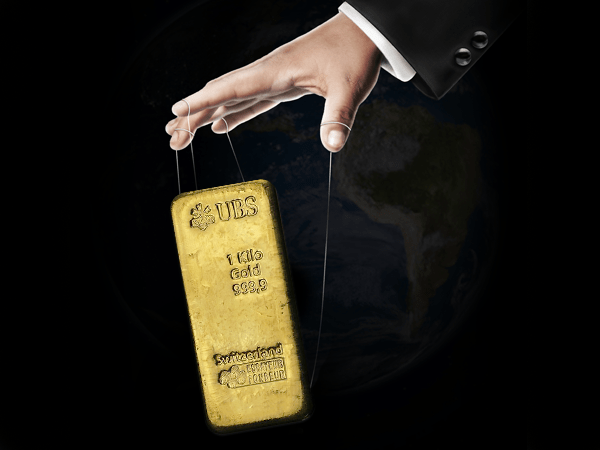 At that point, the gold price manipulation mask would be ripped off, and prices would reflect fundamentals instead. It’s all about the entry point, and right now the entry point seems pretty good. We already know the Fed isn’t telling us the “real” inflation rate. History tells us that gold’s price generally rises and falls in step with the inflation trend. That, or diverging trends eventually reconnect. And that happens because of gold price fundamentals. Right now, those fundamentals seem to point to the next bull market for gold.